Around this time every year, we like to look back on what direct mail trends we noticed over the past twelve months and what we expect to happen next. 2014 was a good year for mail as we saw a return to stability and a bit more optimism. 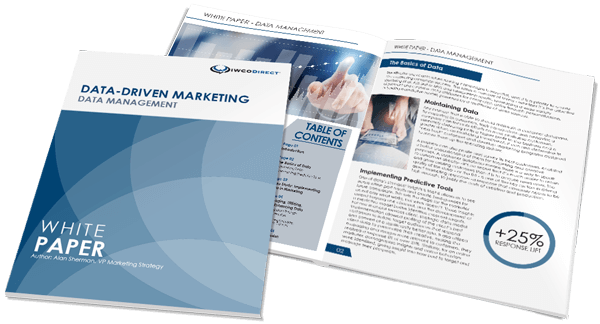 Our clients were definitely looking to grow and spent significant resources to maximize the direct mail channel. This included expanding mail files, increasing segmentation, investing in sophisticated testing programs and trying to leverage emerging technologies. As we move into 2015, there are some key issues and trends that we forecast will emerge in the coming year. What Will Volumes Look Like? We asked many clients that exact question as we developed our plans for 2015. We are seeing moderate growth in volumes across almost every vertical. We expect marketers to continue to invest in direct mail packages containing at least one feature component such as a card, heavy insert, interactive opening device, activation label or special die-cut, etc., as these unique features still drive response. Channel attribution has been and still is an emerging issue. Marketers are still trying to determine the best way to understand and measure how various channels like direct mail, digital, DRTV, social and mobile work together. Clients have moved far beyond last touch models and are beginning to develop sophisticated attribution models (but, admittedly, marketers still have a ways to go). Through our Proprietary Intelligence model, we are helping them with this process and are encouraged by our clients’ interest in working with IWCO Direct to develop innovative test strategies to help with this effort. Increased segmentation continues to be a key focus. One could argue this trend has been around since the dawn of direct marketing, but it is something that we talk to clients about every single day. The focus is to determine how we can leverage data and technology to develop more relevant messaging for customers. With advances in digital color imaging, many clients are rapidly increasing their segmentation, which allows them to increase variability while having minimal impact on production costs and no increase in postage costs. Creating a compelling package will be a must for marketers in order to grow and expand their universe by standing out in the mailbox. Increased imaging, innovative features, card inserts and unique (and larger) envelopes will be leveraged across multiple verticals for higher response. Of course, postage rate increases continue to be a challenge, as they come right off the top of expanding marketing budgets. This is very frustrating for everyone, but it places even greater emphasis on employing postal optimization capabilities to offset some of these increases. Clients are also looking to leverage more from their partners like IWCO Direct, rather than increase their own staff size. We are being asked to participate in many different creative and strategic engagements with our clients as they continue to look for new and innovative ways to speak to their audience. It’s an exciting time for the direct marketing industry, and despite some challenges, I am confident the direct marketing channel will continue to grow and be the primary driver for lead generation. I am very excited about the innovative ways we can work with clients to grow their business in 2015.